The colour is old gold and the texture shows small tears with slow legs. The nose is quite punchy and again bourbon-stylish with lots of virgin oak flavours and rather young spirit aromas. Okay, there are these peaty-medicinal flavours that you hardly find in a bourbon whisky but they are not really integrated with the other aromas (what happens often with rather young stuff - there was simply not enough time to create a balanced profile). No, that is not to my liking! By the way, where is the sherry? I guess the fino sherry casks were completely exhausted and they "rejuvenated" these casks (planing off the depleted upper wood and re-charring the cask what kills almost all flavours of the prior content, in this case the fino sherry). The whisky arrives hot and somewhat biting in the mouth with just a minor coating effect but with no distracting bitter or astringent moments, at least (that I find in a lot of other new Laphroaig releases because of the added share of virgin oak casks). That is better but still not comparable with my beloved Laphroaig mouthfeel from the nineties. The taste is unbalanced as was the nose on mostly wooden and peaty flavours. If you chew it long enough you can detect some shy fruits (banana, apricot) and herbs as well so it gets better the longer you keep it in the mouth. The finish is long and even more peaty-medicinal than the taste. Now the hardly missed new oak moments pop up again with some bitter and astringent feelings (that I do not like). Water smoothes the dram and releases more sweet aromas of heather honey and barley sugars that are highly welcome to create a more balanced dram. I like it best when reduced to about 43% abv. An unusual Laphi, which tastes good to me. Based on the issue price, the PLV is also good. Delicious! Only the departure falls slightly. Well, you just have to take another sip :-) Slainte! Smoke, clear, but rather reserved for a Laphi, vanilla, sea breeze, iodine, mirabelle compote, grape juice, a little honey, the vanilla is always present, goes towards warm custard, ashes, roasted nuts, oranges, roses ?! Exciting! An unusual Laphi! Strong onset, here you can feel the power of alcohol, of which there is not much in the nose, creamy, sweet, a little pepper, almonds, vanilla pudding with honey, some coconut, again mirabelle and grapes, some caramel and in between well-bound , medico-maritime Laphroaig smoke. Sweetener stuff. Water is unnecessary, it is delicious as it is. Roasted almonds, smoke and honey. Rather short. Where to start and where to end? After last year Cairdeas I thought of a more mature version this year. Not as mature and balanced as the 15 year old Cairdeas 2017 (a splendid one), but a more story telling Laphroaig as the 2013, 2014 or 2015. A TCP in your face one like the older batches (Origin, Masters Edition or the 12 year old). But this year again we get some younger Laphroaig with a Fino finish. Why? The Fino isn't as present as expected. They should have done ten years of First Fill Ex-Bourbon Cask maturation or another six month in the Fino Cask. Now you got a wannabe 2013 or 2014 Cairdeas but nothing more (in my opinion). Have I already told you about the 10 year old batch 10 CS? Amazing! 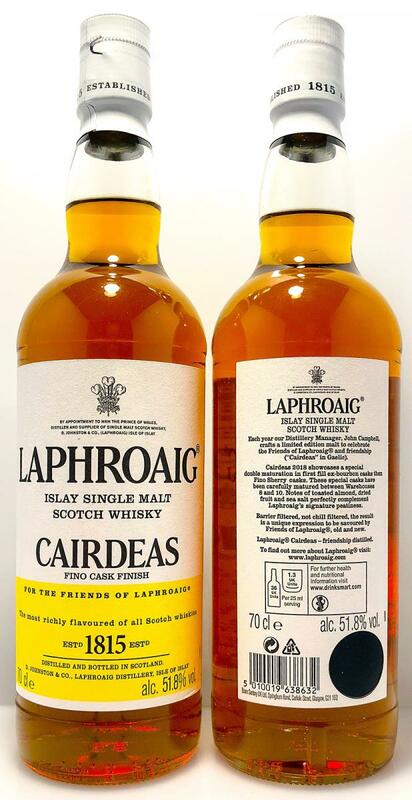 This year again I am wondering if the 10 year old CS release is for Laphroaig fans and friends and the ordinary Cairdeas could be for the...Well, ok, it is still a Laphroaig, quite a decent one but nothing for friends or special by any means. Sweet fruity smoke, minerals, medicinal, nuts, grapes way in the back, hay, hints of earth and ashes in the mix. Sweet fruity smoke. Honey, nuts, caramel, a bit sour. A typical Laphroaig and yet not again! The nose is wonderfully sweet and creamy, the distillery can only be guessed at first. 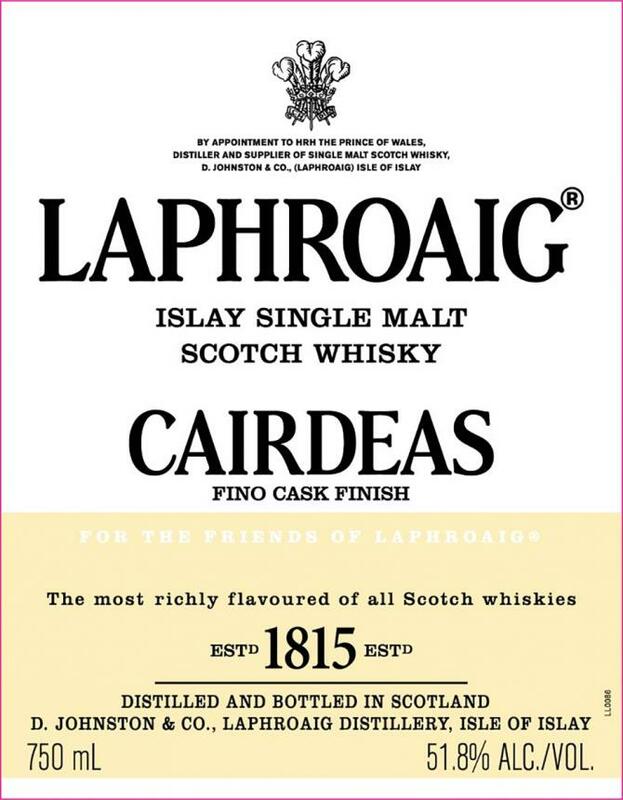 The taste makes it "Bäämm" and the typical Laphroaig character is there. Burnt wood aromas in combination with smoke and peat become powerful and cause campfire romance. The sweet fruit components show up regularly and harmonize beautifully with the intense vanilla and nuts. In the taste and aftertaste the smoky peat shows impressively from which distillery this malt comes. Amazingly, the 51.8% alcohol content is just the right "drinking strength" for me at the moment, which makes Cairdeas 2018 extremely enjoyable. Although it is different in its kind and certainly not a familiar Laphi, I can not understand the sometimes bad reviews. As I said: different, but still a great malt with its own character. Like with good! Oily sticks after pouring a variety of small drops on the glass wall of my Premium Snifter. Bright amber shines in the glass while the first peat flavors seemingly blow over from the glass. Mineral peat rises, roasted aromas and hints of sweet sherry aromas are added and make the nose smell sweet and tasty right from the start. Briefly, maritime and smoky hints appear, the initially mineral peat becomes more fruity. Dried grapes and dark caramel mix, the sweet fruit aroma is getting sweeter and more dominant. Vanilla rises and ends with full apricot and old oranges in a fruity sweet melange. From the initial peat is only very subtle and rarely something to smell, the nutty roasted aromas in combination with the sweet fruit notes are dominant in the foreground. Only now and then does a subtle smoky note rise, the sweet and fruity peat note rarely penetrates the lovely sweet fruit note. The candied apricots and vanilla beans play with the subtle smoky and peaty elements, hazelnuts fall in milk chocolate and end in caramelized sugar. At the first sip, the smoky peat flavors are again in the foreground and fill the entire palate with chubby warm peat steam. Smoke and burned wood envelop the tongue powerfully afterwards, a pinch of salt and sharp black pepper make the tongue glow. Slowly, the sharpness fades away, leaving harsh and bitter wood tones on the tongue. The burned wood burns a bit on the tongue, the smoky aromas become more intense. Dark caramel and dried orange peel under the tongue. The second sip looks as oily as the first sip. Vanilla and apricots flash for a moment, then dark smoke and burnt wood flavors push over the tongue. Finally, the typical phenolic Laphi-Feeling shows, the phenolic smoke is dominant all the time. Once again, the smoky peat slices pull through the palate. The chubby warmth slowly fades and leaves dark caramel with nutty hints. Oily and velvety swims abrasion of oranges and apricots in the stimulated saliva, burned wood and old walnuts provide a harsh component. The unusual combination of peat, smoke, dark caramel, nuts and dried fruit still rests on the palate, leaving a creamy and oily mouthfeel. What a nose for a Laphroaig, what a start on the tongue. Such a crazy UA, you might think. But no, Laphroaig does it himself - and they do it well, very well even, despite all the prophecies of doom. Teen? Of course, every now and then comes through the youth. Bad? Nope, not a piece. The nose is very generous with aromas ... First - in addition to a pleasant and not too intense smoky - juicy apricots and peaches, very sweet, very tasty. Ripe dark cherries in the background. Rarely had such a pronounced fruity and (pleasant) sweet Laphroaig nose. Then, after a long while, comes pepper, lovage, bay leaves and clove powder and accompany the sweet fruit friendly to the exit. Now also freshly tanned leather and oak chips. The sea air with algae, seaweed and salt, here it is. Freshly poured tar in the midday sun, steaming. The peat smoke now clearer and more concise, since the pushed back sweet fruit component can no longer "gloss over" anything. The fruits, which are still extremely sweet in the nose, are also found on the tongue, but not in comparable intensity. Very pleasant onset, slightly oily, with cool smoke and well-balanced apricot, lemon and orange fruit notes. Now and then a little youthfulness in the form of fresh oak chips flashes through. With time comes spice in the form of pepper, thyme, lovage and again the carnations from the nose. The smoke component is concomitant, not dominant, as are the other "classic" Laphroaig building blocks such as seaweed, algae, tar, hospital corridor. Over time, a bit of dark chocolate comes in. Medium to long, slightly dry, now again with the fruit sweetness from the nose and from the start on the tongue, chocolate, cold peat fire, raisins, clove powder. 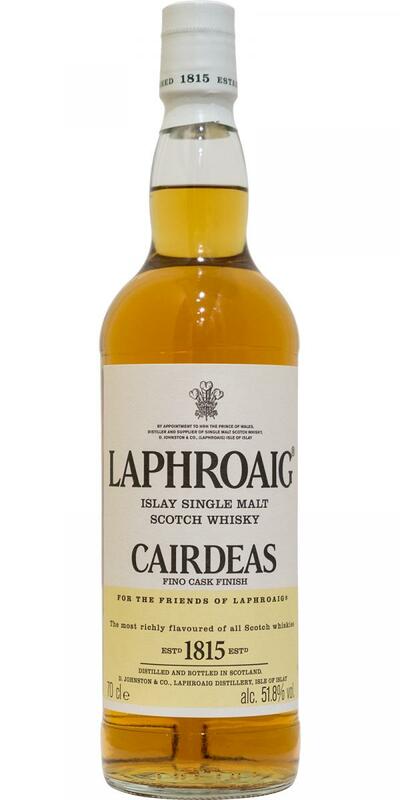 Compared to the Cask Strength, which can assert itself every year as a picture-book Laphi, this Cairdeas shows rather as an unusual variant with a nose for my taste exceptionally successful and interesting. The fino finish has really complemented, refined and tamed the malt with great flavors. A tamed Laphroaig may not be for everyone, but for my liking this has succeeded in a beautiful way. That's another Laphroaig. The first nose is not characterized by strong coastal flavors and a dominant smoldering smoke, but rather a soft and light fruity sweetness (rhubarb, light raisins, apricots) sets the tone. Together with slightly dry nut flavors and a pleasantly acidic component, I definitely want to clearly recognize the fino. In this combination, and especially with an unobtrusive dry smoke and some cocoa, the Laphi shows with a nose that I have so rarely. After a few minutes, the fruity aromas continue to develop and together with an increasingly vigorous vanilla, the whisky reminds me a total of custard with gooseberries, rhubarb and a dash of fino sherry. In the mouth initially dominates a creamy-sweet vanilla note, with the interesting fruit flavors also set the tone. Here are also the typical Laphi flavors such as the wet moss and the smoldering ashy smoke present. As announced in the taste, the malt is now again as genuine Laphi with many smoldering smoky aromas, earthy notes and a subtle dry oak. But even the Fino has left its mark with a slight Nussigkeit and the characteristic fruitiness in the background. I can only agree with Goethe's comment below! This series seems to be bottled from year to year younger. The Fino finish is barely noticeable and looks set. 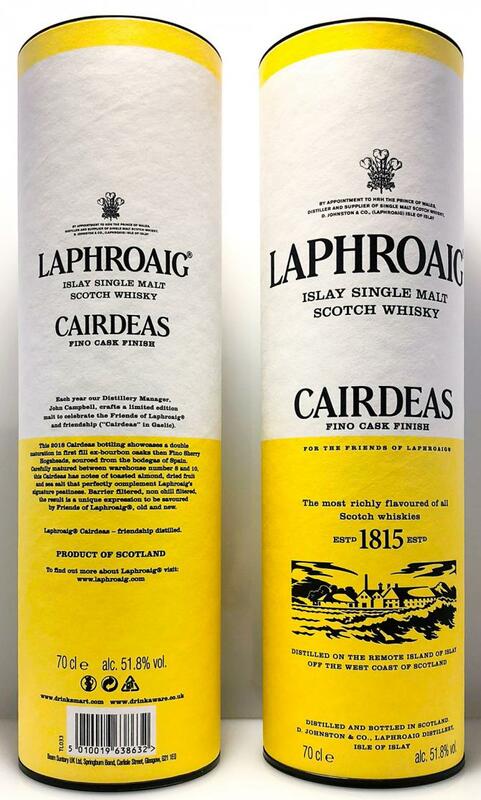 As in recent years, this year the batch 10 wins the comparison to the Cairdeas clearly. Nice strong peated one, I really enjoyed it. Peat, sweet smoke, pretty strong alcohol, fake leather, like you’re walking around in ‘Scapino’. Also some fruits, citrus, and tobacco. A sal ammoniac-kick at first. Pickering, Lakrisal, pepper. Also some sweet notes, some honey. Strong, full, pickering, lots of pepper remain. Sal amoniak, licorice, fake leather, the ‘Scapino’ feeling is back.